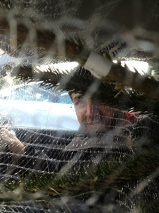 I love Christmas and for me it really starts when we go and get our tree. Through the years I have collected some very special Christmas ornaments and I absolutely love getting them out of their boxes and remembering when I bought them or who I got them from, for me it's such a special way to start the season. So in honor of getting our tree I had to wear something green and sparkly and I chose one of the first holiday polishes I bought from Llarowe, Crows Toes Jingle Balls. For undies I used 2 coats of Color Club Holiday Splendour which is a stunning green holographic glitter polish from last years Color Club Beyond The Mistletoe collection. I didn't have my light box then so didn't manage to get a good picture of that by itself so I will post that another day, but believe me it is beautiful! I topped this mani off with a coat of Crows Toes Jingle Balls. There are lots of holiday polishes like this one this year, I bought this one because I hadn't seen the others yet and although I would have liked some stars I'm glad I bought it because it has a clear base which makes it more adaptable. Topcoat wise it took 2 layers to get this perfect so it wasn't too bad and it lasted for 3 days with no chips and minimal wear. It was super sparkly but I didn't manage to capture that as much as I wanted to, I'm so looking forward to trying all these polishes now without taking them everywhere with me just in case it stops raining or there is a little bit of light I need to capture! And here's my sweet husband trying to navigate us home! It reminds me of National Lampoons Christmas Vacation - my favourite Christmas movie ever!